Bake the Merguez in a 400 degree oven for 20 minutes. Meanwhile, coat the peppers in olive oil and bake them in a 400 degree oven for 15 minutes. Remove the peppers and place in a paper bag, or bowl covered tightly with plastic wrap. When cool, peel the skin, remove seeds and julienne the peppers. Reserve. Chop the cooked Merguez into small pieces. Reserve. Heat the oil in a heavy bottom 4 quart saucepan over high heat for 1 minute. Add the butter. When the butter has completely melted, add the shallots and garlic and sweat them without browning for about 1 minute. Add the barley and stir until it is completely coated with oil and butter. Reduce the heat and add the wine and stir until it is absorbed. Proceed to add the pork stock in 1/3 cup increments, stirring after each addition until absorbed. The barley will increase about three times in size. Season to taste with salt and pepper. Stir in the sausage and the peppers and half the cheese. 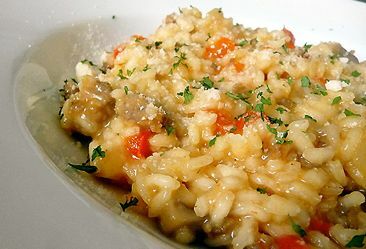 Divide the risotto into 6 warmed bowls and garnish with remaining cheese and chopped parsley.